I woke up this morning and pick up my Charleston Gazette off the front lawn to see the headline "E-mail jolts HMO giant" as the front page story. Yawn, not because I was up late but because this was old news to me. Guess it was probably "new news" to many West Virginia readers. The front page story was a regurgitation of the WSJ article (read some interesting follow up comments from the WSJ Health Blog) that really didn't add anything new to the overall story. There was a companion article, Misleadership critic testified for gay hate crimes law as a teen, that did highlight Justen Deal's West Virginia roots. I've followed this Deal/Kaiser ordeal over the last year since originally reading about the incident via a number of health care related blogs I follow. I've not gone in depth on the specifics on the incident and accusations regarding Kaiser's HealthConnect, thus don't have the ability to comment on whose side to take, but I do find interesting the aspect of the David vs. Goliath struggle that continues online in large part as a result of the blogospere and new media tools. Like Dmitriy, the real story is not what happened last November that was reported as front page news today in Charleston, West Virginia. Instead the story is about the distribution and discussion surrounding Mr. Deal's original email via the blogosphere and social/industry media using blogs and web 2.0 driven tools. The ability of individuals to challenge ideas, groups, companies and industries with these new tools. The power you and I have in collaboration with others to change traditional notions of business, industry and government. Once you start to understand this story you gain a new appreciation for what might be unfolding before us all. The other story this situation highlights in my mind is the question of how long traditional media will survive without changing. So often I find myself reading articles in the morning paper that I have already read the night, day, week or in this case year before. Like this morning - it made me question why I continue to subscribe to my local paper? I find it fascinating that even the writers and editors are moving beyond the traditional constraints of the news media industry structure. The discussion of this and other topic will continue at next week's Health Care Blogging Summit where I will be participating as a part of a panel discussion on the impact of health care blogging with another Kaiser whistleblower. Yesterday I received an email via the OCR-Privacy listserv announcing the launch of a new HHS web site on HIPAA Privacy Compliance and Enforcement. I haven't had time to check out the new website but plan to in the coming days. While scanning the website I found the "Enforcement Highlights" and "Case Examples" section very interesting. In the meantime, here is the press release issued in the email by HHS. To coincide with the fourth anniversary of the enforcement of the HIPAA Privacy Rule, the Department of Health and Human Services (HHS) announced today the launch of an enhanced Web site that will make it easier for consumers, health care providers and others to get information about how the Department enforces health information privacy rights and standards. In launching the website, Winston Wilkinson, the Director of the HHS Office for Civil Rights, noted: "HHS has obtained significant change in the privacy practices of covered entities through its enforcement program. Corrective actions obtained by HHS from these entities have resulted in change that is systemic and affects all the individuals they serve." The Health Information Privacy Web site provides comprehensive information about the Privacy Rule, which creates important federal rights and requirements to protect the privacy of personal health information. The enhanced Web site, http://www.hhs.gov/ocr/privacy/enforcement provides information for consumers, health care providers, health plans and others in the health care industry about HHS’s compliance and enforcement efforts. The new information describes HHS activities in enforcing the Privacy Rule, the results of those enforcement activities, and statistics showing which types of complaints are received most frequently and the types of entities most often required to take corrective as a result of consumer complaints. The other information on the Web site covers consumers’ rights to access their health information and significantly control how their personal health information is used and disclosed, as well as guidance about how to submit complaints about possible violations of the law and extensive guidance for entities who must comply with the rule. HHS issued the patient privacy protections pursuant to the Health Insurance Portability and Accountability Act of 1996 (HIPAA). The first and only comprehensive federal privacy standards to protect patients' medical records and other health information provided to health plans, doctors, hospitals and other health care providers took effect on April 14, 2003. Developed by HHS, these standards provide patients with access to their medical records and more control over how their personal health information is used and disclosed. The regulation covers health plans, health care clearinghouses, and those health care providers who conduct certain financial and administrative transactions (e.g., enrollment, billing and eligibility verification) electronically. HHS has conducted extensive outreach and provided guidance and technical assistance to providers and businesses to help them to implement the new privacy protections. These materials are available at http://www.hhs.gov/ocr/hipaa. Caught this at Between Lawyers and Real Lawyers Have Blogs while RSS'ing this morning. Lately I've done a number of posts on Health 2.0 companies and thought I would switch gears to Law 2.0. I'll be watching with interest the roll out of Avvo, a new online legal services startup that has garnered significant (to the tune of $10M) interest from the VC community. Apparently, Avvo is short for "Avvocato," which is lawyer in Italian. If you want to sign up to beta test Avvo or share your ideas on how to make the legal industry a simpler place, you can let Avvo know. UPDATE (6/4/07): Kevin O'Keefe at LexBlog is reporting today that Avvo is making its official entrance tomorrow. I'm interested to see what they offer to the legal community and those who need/use lawyers. UPDATE (6/11/07): Denise Howell at Lawgarithms has the latest on the threat to sue Avvo and great analysis (with links) of some of the legal issues swirling around reputation based rating systems like Avvo for lawyers and Section 230 immunity. Also, this week's Blawg Review #112 at Justia's Legal SEO and Marketing Blog spills a lot of "l-ink" over Avvo. David Harlow of HealthBlawg makes an interesting observation of the difference between lawyers (Avvo) and physicians (Sermo). UPDATE (6/12/07): More from Kevin O'Keefe at LexBlog on the pending class action lawsuit that appears likely to be filed against Avvo. Tonight I saw this photo/graphic on Rick Lee's Blog and thought I would share it with those of you who regularly visit here. If you are inclined (and a blogger) take a few minutes and post the image. 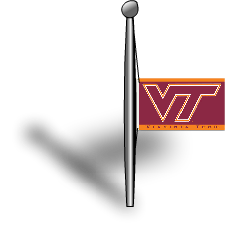 I'd like to see this spread around the blogger community to honor those at Virginia Tech and the community of Blacksburg, Virginia. You can find a link to the image here. Thanks to Alan Goldberg, Moderator of the AHLA HIT listserve for linking to this article in the Economists on McClinics. The article also covers RediClinic, another Steve Case funded health venture which is part of the "Revolution" concept of Revolution is - Resorts - Living - Health - Future. This week Revolution Health will be making its official debut. For the practitioner's view on RediClinics check out The Solo Practitioner and more from Technorati. UPDATE: Over the last couple of weeks there have been numerous articles and online discussion regarding Walmart, CVS (Minute Clinic) and Target's movement into the retail clinic concept and what impact it might have on the traditional model of physician office health care delivery. The WSJ Health Blog post about whether retail clinics will be the disruptive innovators of health care. The WSJ Health Blog poses the following Health Blog Question of the Day: Are retail clinics a force for good or a prescription for bad medicine? I will be interested to watch how the West Virginia's provider communities, legislature and health regulators look at the development of these clinics. There are a number of legal issues that quickly come to mind as a part of developing these in West Virginia and other states. For example, how will these clinics be viewed, especially if they offer some diagnostic services under West Virginia's certificate of need laws. How will the clinics be viewed within the gray area of West Virginia's corporate practice of medicine doctrine. What position will the Board of Medicine take on these clinics. I'm also intrigued by the idea that these types of clinics might become the backbone of a national health information network. If anyone is good at standardization at low cost its Walmart. Why not Walmart EMR. In West Virginia, like many other rural states, Walmart has become the defacto center of commerce in small communities. Here in West Virginia the local hospital and Walmart are the two biggest employers in most rural counties. Interesting to see that Walmart's clinic concept includes contracting with local hospitals. UPDATE (5/18/07): Walgreen Co. is the latest to get into the convenient health care clinic area with its announcement of the acquisition of Take Care Health Systems. According the the news article,Take Care Health Systems operates 50 health care clinics in Chicago, Kansas City, Milwaukee, St. Louis and Pittsburgh." For more on the acquisition here is the Walgreen press release. Google Vice President, Adam Bosworth asks the following question over at the Google Blog -- How do you know you're getting the best care possible? Note: At the end of his post he asks to hear from you. Those interested in seeking improved health care information online and becoming more engaged (and knowledgeable) in their own health care will find his post interesting. It also might shed some light on Google Health. For example, Bosworth talks about how do you know what online medical information is reliable? Are you getting the best standard of care? I would add to the list of his questions -- can I know what I am going to have to pay before I receive the care? what health care provider can provide me with the most economical health care? The post highlights what I see as the need for "us" as patients to be become better advocates for ourselves when visiting a health care professional for treatment. More individuals are faced with the question of care vs. cost which has lead to patients being more active consumers of health care. As more and more of the costs of health care are shifted to individuals the resulting outcome is that those individuals have been forced to take a more active role in trying to manage their health care and the associated costs. Technology is finally allowing health care consumers (and physicians) to free themselves from the historic systems of the industry. Health consumers are starting to use technology to take an interest in understanding their condition, seeking support from others, managing the care and conditions, monitoring payment and cost, finding the best physician, diagnosing themselves, seeking cheaper/faster care, monitoring the public health conditions and otherwise looking online for their health care needs and wants. It will be interesting to see what impact the political climate of 2008 will bring to this discussion. Update: I've linked to some of the smaller health 2.0 companies experimenting in the health sector. Today I noticed that Matthew Holt, one of my favorite health care policy bloggers, speculates a bit on which large lady will chant, WebMD, Google, Revolution Health or Microsoft. Today's NY Times features Revolution Health as it readies for its official launch this week. Mr. Bosworth addresses a point that I have often discussed with others -- how do you and I as patients find out who best to treat us? What doctor is best suited to treat my needs based on numerous factors. Mr. Bosworth poses this question -- "what does 'best' really mean?" Maybe I'm a more conservative patient or a patient who desires a more aggressive approach requiring surgery. How does search account for such subtleties. Different doctors take different approaches to these types of patients. My on experience is that I start with my primary care doctor's recommendation (or another trusted source) - but often there is no way to confirm the recommendation. I'd like to back up this information with more detailed information. Bosworth's post also discusses Google's "labeling" feature (not sure what this feature is - I ran a Google search trying to find out more info about the feature but don't see anything). Mr. Bosworth concurs that the "labeling" feature needs to be highlighted and explained better by Google. Also, an interesting stat that I noticed while reading Mr. Bosworth's wikipedia entry. A survey of 1,000 people found that 12% first turn to Google to learn about a medical problem. For other interesting stats from the survey check out, More people consult Google over health. Also, on a related note -- for an insiders view of how Google is learning about the how to share data without revealing private information check out Privacy Preserving Data Mining by Shahid Shah, The Healthcare IT Guy. Shahid takes the logical step of thinking how Google might apply this type of learning in the health care industry. A couple of weeks ago I had the opportunity to speak to a local group of business executives on the topic of The Value of Blogging in Business with Skip Lineberg and Matt Ballard. During Skip's Ten Reasons To Blog portion of the presentation he used a couple of slides highlighting the concept of "reaching the world . . . or reach across town -- do either . . . Do both!" This week I have a wonderful example. Over the last few months I have had the opportunity to communicate with Bertalan Meskó a medical student at the University of Debrecen, Hungary who blogs at ScienceRoll (and his Hungarian blog, MedIQ). He has an interest in the concepts of health 2.0 and medicine 2.0 that I have spent a fair amount of time lately writing and thinking about on this blog. This week Bertalan posted about his upcoming Genetics and Web 2.0 Presentation. Traditional notions of collaborating or doing business with someone down the street vs. across the globe have changed. This change impacts all industry -- from the practice of law to the practice of medicine to all industries. Just an example to think about what impact it might have on you as I sit here in Charleston, West Virginia and Bertalan sits in Debrecen, Hungary. Bertalan also gives credit to Ves Dimov, M.D., an Assistant Professor at the Cleveland Clinic who "gets" the new health 2.0 technology and is harnessing the technology in practical ways via his blog, Clinical Cases and Images - Blog. His post and presentation on How to Use Web 2.0 In Medicine? is another good introduction to health/medicine 2.0 concepts. UPDATE: This evening I saw this post by Tony Chen at Hospital Impact providing a Consumer's Guide to Healthcare 2.0 Websites. Great summary of Health 2.0 type companies and their popularity via alexa rankings. Thanks to Will Weider, CIO at Affinity Health System in Wisconsin, who blogs at Candid CIO for linking to my summary of Health Care Blogging and Web 2.0. For those of you interested in hospital health care IT issues I would suggest reading Will's blog (or better yet pick up Will's RSS feed). for the latest on HIPAA enforcement statistics by OCR click over to Mike Cassidy's post at the Med Law Blog: HIPAA Criminal Verdict and Enforcement Statistics. The post also contains some stats on the number of matters reported to the DOJ for investigation. The post includes a summary of United States v. Ferrer, S.D. Fla., No. 06-CR-60261-CR-Cohn, the first criminal HIPAA verdict entered in January 2007. The case involved the wrongful disclosure of individually identifiable health information and identity theft of 1,100 patients from the Cleveland Clinic which were used to fraudulently bill Medicare claims to the tune of $7M. The West Virginia Bar Blast reports that the pro hac vice admission fees for West Virginia will increase effective July 1, 2007. The fees will increase from $150 to $250. The West Virginia Supreme Court of Appeals entered the Court Order amending Rule 8.0 of the West Virginia Rules of Admission to the Practice of Law on March 19, 2007. The complete Rules for Admission to the Practice of Law in West Virginia can be found on the Rules Section of the WVSCA website. Also, you may want to check out Advisory Opinion 93-005. With April 15 quickly approaching out-of-state lawyers may also want to read the following summary by Susan Romaine on a 2006 tax publication issued by the West Virginia State Tax Department regarding tax obligation of nonresident lawyers. The West Virginia State Tax Department publication, Nonresident Lawyers - Tax Reporting and Filing Requirements, provides more details. These requirements apply to any out-of-state law firm or attorney who enters for the purpose of practicing law or conducting business relating to the practice of law in The requirements are directed towards any attorney who enters the state for relatively short periods of time for the purpose of taking depositions, consulting with local legal counsel and clients, conducting discovery, attending court proceedings, and engaging in settlement negotiations and for trials or other work in The requirements apply to any attorney working under these conditions, whether they are paid on a contingency fee,hourly fee, or other basis.Out-of-state law firms and attorneys may be subject to any of the following taxes: business registration and franchise taxes, corporation net income tax, personal income tax on partnership and S-corporation income, consumer sales and service tax, local hotel/motel tax, personal income tax on employees, and the withholding tax. If you like top 10 lists and you're involved in health care - then check out Tony Chen's Healthcare Top 10 list of Top 10 lists at Hospital Impact. I've scanned a few of the links and can't wait to check out more when I have some time. Tony's a health care innovator and one of my favorite health care blogging colleagues. He is in my top 10 list of health care bloggers. Health Care Mashup: Who Is Sick? A good example of health 2.0 and what is on the horizon for health care. Another unique approach to solving health care problems through technology and social networking. Who is Sick? is a public health mashup using consumer driven (social networking) health information and Google maps. Just imagine the public health possibilities. Here is the background and history behind this new health 2.0 company. Thanks to Tony Chen at Hospital Impact for pointing out this new health care venture. Do you want to know what others think about your doctor? Check out RateMD another interesting health 2.0 startup focused on consumer driven information. How about comparing what you are paying for health care vs. what others are paying? Check out MedBillManager which allows you to manage, track and compare what others are being charged for health care. West Virginia Medical Student Seeks Advice On What To Do . . .
Paul Levy, the blogging CEO at Running A Hospital provides some advice to a West Virginia medical student who responded to his post "Students, Are you curious?" (a weekly Wednesday feature). Great discussion of the reason why we need to encourage more physicians to go into primary care and some of the barriers that exist under the current system. Don't miss reading the comments. As a fellow West Virginian who grew up in a family of country doctors -- I hope that Paul is right and that there is a shift focusing back on the value of primary care practice (for another perspective on what drives the value of primary care -- read physicians upset about nurse anesthetist incomes). I had the pleasure growing up to watch the positive impact that good primary care services can have on individuals, families and a community. My dad and uncle were both physicians (and my grandfather) serving Wetzel County. Efforts need to be made to create incentives to allow doctors to spend more time to talk with patients and the families with a focus on preventative care and early detection. One modern concept is the new "micro practice" - what Dr. Charles calls the new old fashioned family doc. In my opinion this would have a positive impact on care and outcomes. Paul's post reminds me that I need to stick with my promise feature of the "West Virginia Doctor". I need to post some more stories to help highlight some of the valuable (non-monetary) personal benefits of being a primary care physician. Yesterday I participated in a panel discussion on the value of blogging in business. The Charleston Area Alliance held the event as a part of its CEO Roundtable Luncheon series. Also serving on the panel was Matt Ballard, CEO of the Charleston Area Alliance who blogs at the CAA Blog and Skip Lineberg, Chief Creative Officer of Maple Creative who blogs at Marketing Genius from Maple Creative. The event was a success and hopefully we were able to share some new information about the value of blogging and how it can impact the relationship you have with your clients and potential clients. It was a diverse group who attended and there were some great questions from the crowd. Skip Lineberg has a post-presentation post on the event (with photos). We intentionally decided not to hand out the presentation but rather make it available via our blogs through SlideShare (for those of you attending -- another one of the new web 2.0 companies). Call it the Flickr or YouTube for Power Point. Until today I had not used SlideShare which I first learned about from another West Virginia blogger, Lee Kraus who authors Learning and Technology. Lee has some interesting comments about the business uses of SlideShare.